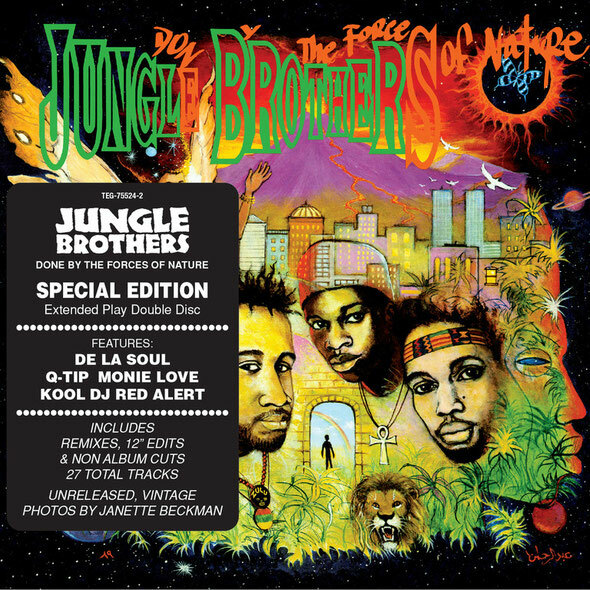 The Jungle Brothers' 1988 debut, ‘Straight Out The Jungle’, was a landmark release in the development of conscious hip-hop. That album's successor, 1989's superior ‘Done By The Forces Of Nature’, builds on the innovations of the group's debut and adds the polish of major label production under the steady eye and ear of Kool DJ Red Alert, the work’s executive producer. 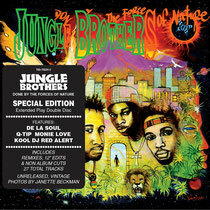 The Jungle Brothers major label debut offered a spiritual take on black America that was as mellow as it was playful. Though the Jbeez’ sonic affiliation with the underground is still intact, the album is cleaner, less dated, and generally easier on the ears than the independently released ‘Straight Out The Jungle’. The group's sophomore effort is a vivid tapestry of buoyant beats; sampling from jazz, world music, classic funk, R&B and even house and club style beats (seldom heard in hip-hop). The raps remain centered primarily on the Afrocentric themes for which the Native Tongues posse (De La Soul, A Tribe Called Quest, Queen Latifah) was well known (‘Acknowledge Your Own History’ and ‘Black Woman’ are strong examples), but the group's seriousness does not dismiss their need for more light-hearted, rump-bumping fun (see: ‘What U Waitin' For’, ‘Belly Dancin' Dina’). Smart, witty, and musically sophisticated, but never a commercial smash, the Jbeez remain one of rap's most influential groups, and this excellent set proves why. The two discs boast the original album in all its sonic glory with top notch features from De La Soul, Q-Tip, Monie Love, Kool DJ Red Alert & Karen Wheeler plus remixes and 12” edits by the likes of Norman Cook aka Fat Boy Slim, CJ Mackintosh and Tony Humphries as well as non album cuts; 27 tracks in all. Janette Beckman rounds out the package with vintage, previously unreleased photography. Thank you for the good writeup. It in truth was once a amusement account it. Glance advanced to far delivered agreeable from you! By the way, how can we keep up a correspondence?